The European Commission is becoming more like a regular government. Due to revisions in the European treaties and internal reforms of the civil service, the European Commission is acquiring many of the organizational features and behavioural patterns that are highly typical of “normal” executives in national settings. This is the main conclusion of the book “The Normalization of the European Commission” which is released in June by Oxford University Press. The study relies on a large number of in-depth interviews with top officials and commissioners working at the European Commission’s apex. European Parliament controls the Commission.The European Commission, previously often seen as the European Union’s civil service, has in recent years increasingly come to play a more political role. Since the debate on the “democratic deficit” in the EU in the early 90s, a long series of revisions in the Treaties changed the legal and political framework within which the Commission operates. The power of the European Parliament has significantly increased, not only in the drafting of legislation, but also in the democratic control and accountability of the European Commission. The Commission should therefore increasingly take into account the European Parliament. Parliamentary control of the Commission manifested itself also in the existing trend of making the appointment procedure ever more liable to politicization. Each new commissioner has to appear before parliament and to answer questions. European commissioners act like national ministers. The political control by the European Parliament has significantly changed the Commission. Commissioners have started to act as ministers. They are not quasi-civil servants but professional politicians. They need to explain their policies to the outside world and are politically accountable to the European Parliament and the media. The Commission has become a more partisan and a more politicized body than ever before. It can no longer impose its decisions without a fuller consent by the governed. Policies are not struck in isolation inside the EU Commission. This means that commissioners have to spend much more of their time explaining situations, setting out the various options and trade-offs, and persuading those involved to join with them. This can lead to frictions and the contestation of decisions between the Commission and the EP, but isn’t this the way things work in any government? A political-bureaucratic divide. The emergence of new political and administrative accountability arrangements has strengthened internally the separation between the political level, the commissioners, and the administration of the Commission, the Directors-General. The latter are not selected on their nationality or their political loyalty, but on the basis of expertise. Territorial principles of organization (flagging, parachutage) that had underpinned the Commission for so long lost their significance. Thus, the Commission has increasingly become a real government, with a clear separation between politics and administration. 2014: the election of the President of the Commission. In 2014 after the election of the new European Parliament, the EU goes one step further: the President of the European Commission will be elected by the European Parliament (rather than, as previously, being appointed by the European Council). The distribution of seats in the European Parliament, but also the choice for the President of the European Commission will depend on the election results. Based on the findings in this study, it can be argued that European citizens should seize the political campaign to widen the public debate on the future political direction of the Union in the upcoming elections. Political parties should play an important role in this. European political “families” could implement a Europe-wide political campaign and come up with suitable candidates who will be eligible for the presidency of the European Commission. The EU Commission more democratic than most national governments. With the election of the President of the Commission, the European Commission will become in fact more democratic than many national governments. Democratic accountability provisions are currently in place around the Commission; what is important now is the input and involvement of European citizens. Book: Anchrit Wille (2013): “The Normalization of the European Commission: Politics and Bureaucracy in the EU Executive” Oxford: Oxford University Press. This is a guest post by Frank Häge, Lecturer in Politics at the University of Limerick in Ireland. The post appeared first on the LSE’s EUROPP blog. In recent years, media reports about how the EU is trying to tackle the financial crisis often give the impression that EU policy is dictated by a few large member states. This picture is quite a misrepresentation of how the EU actually works. When it comes to the adoption of new laws, the Commission and especially the European Parliament play a significant role in the decision-making process; and decision-making amongst government representatives in the Council is much more equitable than often suggested. In fact, one of the major puzzles about Council decision-making is the high rate of consensual decisions even in areas where the formal rules allow for the adoption of law by a qualified majority of member states. Every year, about 75 to 85 per cent of the Council’s legislative decisions are made without negative votes or abstentions. A number of explanations have been proposed to account for the high consensus rate of Council decisions. First, consensus might simply reflect common agreement about the desirability of policy change. Second, governments might try to make sure that everybody is ‘on board’ because of concerns about the correct and timely implementation of EU policies at the national level. Third, vote trading between member states across issues or proposals allows the creation of larger compromise packages. Finally, a ‘consensus reflex’ developed as a result of years of Council decisions requiring unanimous consent might still be operating in the Council even though the institutional context that originally required unanimous agreement is not present anymore. Each of these theories is a generally plausible candidate for explaining the high consensus rate. However, all of them have trouble accounting for the lack of change in the consensus rate despite large increases in EU membership size. 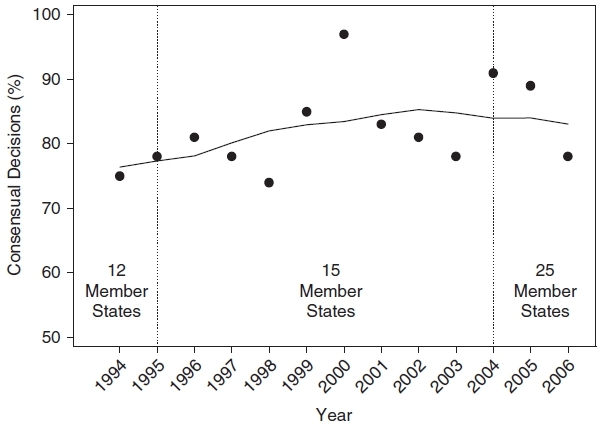 The big bang enlargement in 2004 increased the preference heterogeneity of member states, so common agreement on policy change should have become less likely. The cost-benefit calculations of bringing everyone ‘on board’ should also have tilted in favour of less accommodation towards recalcitrant member states. Accommodating everyone becomes more costly the more member states there are. Successful exchanges of votes that make all member states better off should have become exponentially more difficult as well. Identifying beneficial vote trades is much easier with 15 than with 25 member states. Finally, informal norms and rules of behaviour that underlie the consensus reflex should have been harder to sustain and enforce after an influx of a large number of uninitiated new member states. In short, based on existing theories, we would have expected the consensus rate to drop after the enlargement in 2004, yet as Figure 1 shows, the empirical record does not bear out this expectation. In my research, I developed a coalition-building model whose predictions are both consistent with the observed consensus rate and the insensitivity of the rate to changes in membership size over time. I argue that consensus emerges more or less coincidentally from the coalition-building process itself. If the formal rules allow the adoption of Council decisions by qualified majority, member states have an incentive to actively engage in the negotiation process to ensure that they are not marginalized. Government representatives are considered to be boundedly rational actors. Their behaviour is goal-oriented, but in the complex environment of multilateral multi-issue negotiations of the Council, they follow relatively simple heuristics to pursue their policy goals. A plausible heuristic for government representatives is to band together with negotiators from other states with similar positions until their coalition is large enough to formally block a decision. Being part of a blocking coalition ensures that the member state’s views cannot be ignored; and forming those coalitions with like-minded states ensures that policy losses remain relatively small. As a result of this behaviour, larger and larger coalitions form until either one coalition is large enough to ‘unilaterally’ adopt the proposal through a vote, or all member states are organized in two or more blocking coalitions. In the latter case, the agreement of all blocking coalitions is required to adopt the proposal. Thus, in this situation, consensus emerges endogenously as an unintended by-product of the coalition-building behaviour of negotiators who seek to form blocking minority coalitions. I formalized the theoretical argument in a computational agent-based model and used a case study of the adoption of the Council’s common position on the batteries directive to illustrate the empirical plausibility of its coalition-building dynamics. In the case of the batteries directive, as in many of the model simulation runs, larger and larger coalitions formed over time until the final compromise was in the end brokered amongst a number of blocking minority coalitions. In addition, the assumption of Council negotiators as blocking-minority seekers is supported indirectly by evidence from existing qualitative research, interview studies, and practitioner reports that stress the central importance of coalition-building in the Council negotiation process. However, the model is not only based on empirically plausible behavioural rules governing the interactions of agents; it is also able to predict the consensus rate in the Council with quite some accuracy. For the three periods with different membership sizes between 1994 and 2006 (12, 15, and 25 member states, respectively), the model predicts consensus rates of 89, 85, and 85 per cent, compared to the observed mean consensus rates over those periods of 75, 82, and 86 per cent, respectively. Furthermore, this prediction accuracy is achieved without taking into account any empirical information about the particular negotiation processes during that period of time. The only changeable parameters of the computational model are the voting threshold and the number of member states. To generate the predictions about the consensus rate, the voting threshold was set to the real-world threshold of 72 per cent and membership size to the respective number of member states during the particular time period. The simulation was then run 1000 times with initial policy positions of actors chosen randomly at the beginning of each run. Note also that the predicted rate is rather insensitive to changes in membership size, although the model was not explicitly designed to reproduce this feature of the observed consensus rate. Given the good predictive record of the model, I further investigated various ‘if then’ scenarios by varying the number of member states and the size of the majority voting threshold. The findings of those computational experiments further confirm that the model predictions of the consensus rate are relatively insensitive to changes in membership size. In contrast, higher voting thresholds are predicted to significantly increase the consensus rate. If the model is correct, future enlargements of the Union should not have any significant effect on the extent of consensual decision-making. However, the decrease of the voting threshold from 74 to 65 per cent in 2014, as envisaged by the Lisbon treaty, should considerably reduce the number of consensual decisions in the Council. Enlargement as a modernization or harmonization project? On 30 May, we publicly opened a three year research project evaluating the lessons of the EU’s previous enlargements, especially the ‘big bang’ enlargement to the East as well as possibilities for integration in the future. The presentations at the opening conference, in Berlin, outline plans for research, but also, already sketched some interesting puzzles and questions. A key question which has occupied me – and other scholars – for many years, was raised by one of the European Commission speakers: in his view, fulfilling criteria for accession to the EU is not necessarily the same as becoming more developed economically. He suggested that pushing a development agenda through enlargement has its limits. It was stressed that the objective of pre-accession preparations is for candidates to become as similar to the EU member states as possible – policy-wise, mostly – as it has always been in past enlargements – through adopting the acquis. From this perspective, economic development cannot be an accession criterion as such as it could delay accession forever. Neither was the EU’s political criterion from Copenhagen intended to be or equivalent to a fully fledged programme for democratization. In a way, the Eastern enlargement’s overall success and the success of the countries that participated in it to make huge progress in reform, can make us forget the limits of the EU’s mission and possibilities there. While it is fully understandable that the European Commission and indeed, other EU institutions, need to define their mission in enlargement in terms of the EU’s overall strategy and in concrete terms based on pre-defined accession criteria, for most of the scholars dealing with the last enlargement, the modernization, development and democratization effects of the last enlargement appear unmistakable. There are, in fact, many scholars and commentators who see the completed Eastern enlargement primarily as a modernization project, whereby the term ‘Europeanization’ is used to denote structural reform, state building, restructuring, growth… Our project consortium colleague, Laszlo Bruszt, for example, has written about the state making effects of the EU’s big bang enlargement, which he sees as unintended consequences of the EU’s ‘demanding performance criteria’. Remembering the start of post communist transformations, however, democratization and economic reform – uncertain as they were in some countries – were domestically initiated and driven processes, which the EU was initially reluctant to commit to. Only after 1993 when the EU offered the so called accession perspective for Central and Eastern European states, did the Union provide a goal and a kind of reform template for the states that became serious candidates. So, as I have argued elsewhere, there are good historical – and analytical reasons – to keep post communist transformations and pre-accession preparations separate. Yet there are also reasons to claim that the two processes reinforced each other and the one would not have succeeded without the other. This may be different for states that become candidates for accession at a different stage in their political and economic development. In other cases, as one of the conference papers noted (an earlier version of this argument has been developed here), the EU may act as stabilizer and not as ‘democratizer’. We should not forget that the provisions of the EU’s acquis (regulations and policies resulting from bargains between older member states), which candidates must adopt almost entirely before accession, may not be beneficial for all economies and in all institutional settings. In other words: despite more than a decade of scholarship, commentary and analysis, there may still be some major unanswered questions about the effects, processes and mechanisms underlying the EU’s enlargement: one of several themes which the MAXCAP project will research in the coming years. We will keep you posted. Disclaimer: This post is written in personal capacity and does not represent the views of the MAXCAP partners, Leiden University or the European Commission, which funds this project under its Seventh Framework Programme. This post was edited on 12 June 2013 to represent better some views expressed at the conference.